WE HAVE A FEW TICKETS THAT HAVE BEEN RESERVED THAT MAY BECOME AVAILABLE NEXT WEEK. IF YOU CAN MESSAGE US DIRECTLY WE WILL GIVE YOU FIRST REFUSAL. old school disco tunes to sing and dance along to. get yours now to avoid disappointment!! Now in it's 4th year Octobeerfest is getting bigger and better. 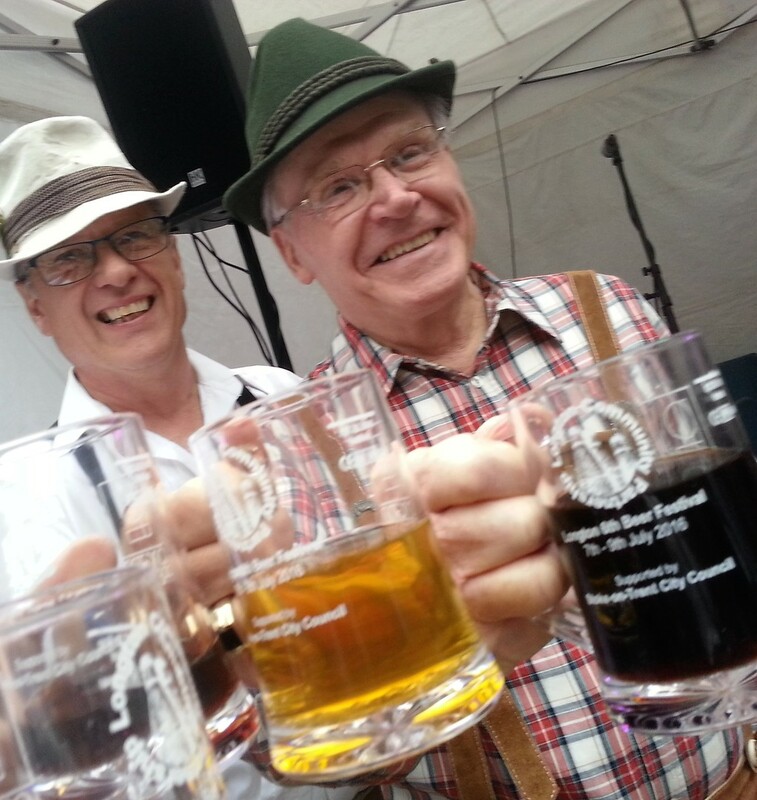 A Stokie take on a German favourite our Octobeerfest has Music, Beer and Wurst a plenty. Lederhosened up the band play a mix of traditional German Oompah with a splash of cheesy pop ensuring that when adequate beer has been consumed there is plenty of dancing.We have even imported an actual German on Trumpet to give it the authentic feel! Stokie Christmas Market at Hanley Community Fire Station. The Lord Mayor of Stoke on Trent, Cllr Anthony Munday made a heartfelt thank you, and an apology, to Penkhull Village Brass last night as he officially switched on the lights in and around the centre of our lovely village. The apology was only that he hadn't had chance to thank the Band for the fanfare welcome and our opening of the Lord Mayor's Charity Ball at the Kings Hall two weeks ago - he was rather busy that evening so we didn't mind! Cllr Munday, the First Citizen of Stoke on Trent, not only thanked the Band during his official address but also made the time to speak to the members personally, including Chairman Gary Standeven (pictured) before joining us in The Greyhound Inn for a well deserved drink. Cllr Munday and Village Vicar, the Reverend Chris Rushton, not only described the Band as part of the furniture in Penkhull but even suggested as the prime band for the Lord Mayor and many of the celebrations in The City that we would soon be re-branded as a City of Stoke Band. We think we prefer Penkhull Village Brass - it has a lovely ring to it and a wonderful community to share it with too. We are the Village in the City after all. Take a look at some of the pictures in our photo gallery. Penkhull Village Brass was granted charitable status in October following a very successful first eighteen months since we began last year. As a result we were able to apply for community funding for our next project, a Training Band which will offer people old and young the opportunity to come and learn, or re-learn a musical instrument in a fun and friendly group environment. “We know that people learn better in group situations” said Media Officer Mike Mulroy. "Music is supposed to be fun, it is supposed to be enjoyable, that’s why we started this band. Being in a small group of like minded people who enjoy what they do and share jokes and experiences; become friends really, to entertain people and see the joy in the eyes of the audience and the players is truly what it is all about for us." 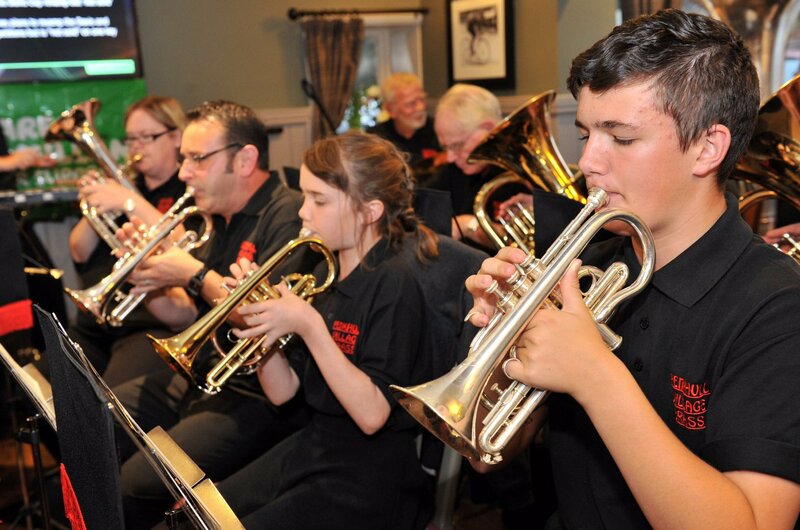 The current players come from all over Staffordshire, from Leek in the North to Albrighton in the South and we will be assisting two local schools to offer additional training and support to their young brass players. This week the band also signed a reciprocal agreement with local micro brewery RAN Ales from Fenton. Run by Neville Smith and his partner Karen, they first met the Oompah Band at the Gladstone Museum Beer Festival where we were performing and Nev and Karen were exhibiting their wares. RAN Ales immediately saw a connection as they loved the music we were playing and offered to help. Mike Mulroy, who has helped to forge the agreement said, “It was like love at first sight, they loved our music, we loved their beer and their attitude.” After some initial meetings we invited them to run the bar at our incredibly successful Oktobeerfest and the love, well it just blossomed. Recently Glynn, Band Chairman Gary Standeven, also from Trent Vale and Louise Cooper, the Treasurer from Eaton Park secured £1000 of funding from a Christmas Giveaway event hosted locally by Seedbed. The trio made a presentation and representations to the panel along with several other local charities and community groups and were successful in the full amount of their request. The Band has already purchased new instruments which arrived this week ready for the first session which will take place on Tuesday 17th January 2017 and every Tuesday after that. 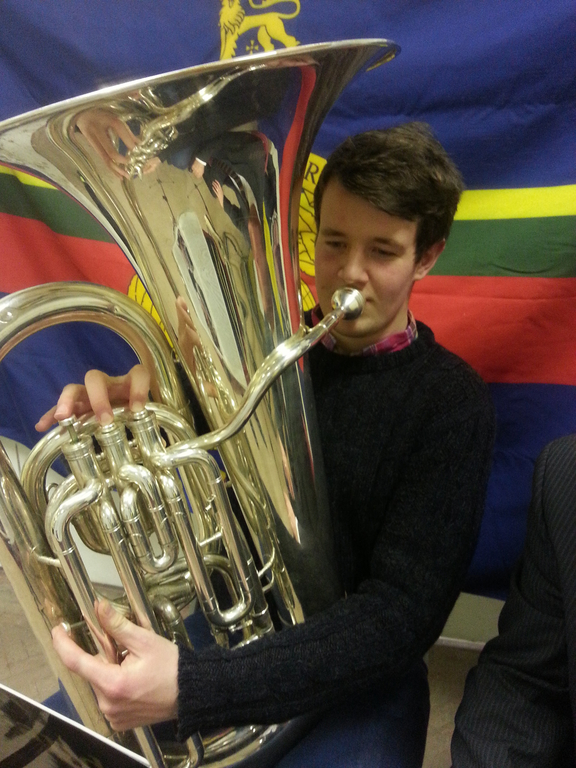 There are a limited number of instruments that we can loan to people wanting to learn so it is important that people who would like to join contact the band as soon as possible to register their interest. Pictures show the Band members in their new Oompah costumes courtesy of RAN Ales and the new instruments purchased with the recent grant. 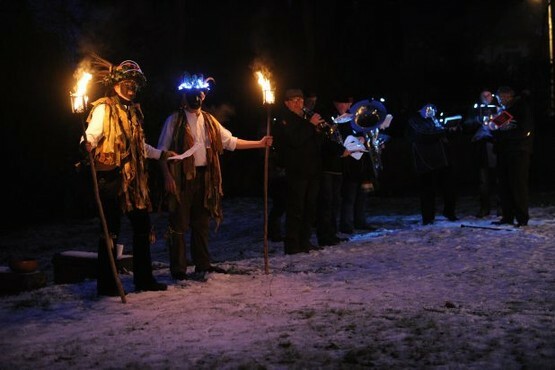 It may only be December 1st but the band had performed at three recent Christmas gigs by December 1st. 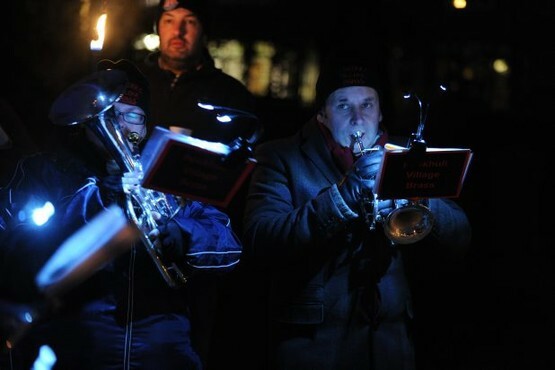 Somebody once said you can never start Christmas too soon so we started with the King's Christmas Market - stars of the show for the shoppers and the queueing crowds were, you guessed it, Penkhull Village Brass! Only a few days passed before we were again back to the King's Hall in Stoke, to open the Lord Mayor's Charity Ball and welcoming the Lord Mayor himself to the floor with the theme from Rocky. If you happen to do your shopping at Tesco in Hanley then come and say hi on Tuesday evenings between now and Christmas - in case you missed us this week, check out some of our photos. Chairman and former Warrant Officer Bandmaster for Her Majesty's Royal Marines Gary Standeven sounded the Last Post and Reveille to the hundreds who turned out to remember those who have made the ultimate sacrifice in the service of their Country. The Band took on a more sombre tone than of late for the occasion, keeping the crowds warm before being joined by the Audley Male Voice Choir to lead the congregation in the hymns. One former serviceman spoke very highly of the band afterwards, "It's wonderful that the band is here again to support the parade in Hanley which is growing every year. The band sounds so amazing, I could listen to them all day!" More photographs from Remembrance Sunday in Hanley appear in our photo gallery. The Band recently took to the minstrel's gallery in the magnificent setting of Keele Hall to welcome the hundreds of guests to Santander's annual charity ball. With some favourite tunes that took the guests right back to their childhood the band was quickly the focus of attention before dinner began and of course they all had to join in with our local favourite 'Delilah'. Many of the guests agreed that the band should have played throughout the dinner but perhaps it would make us all more hungry than we already were! easy listening music to get the event off to a great start! 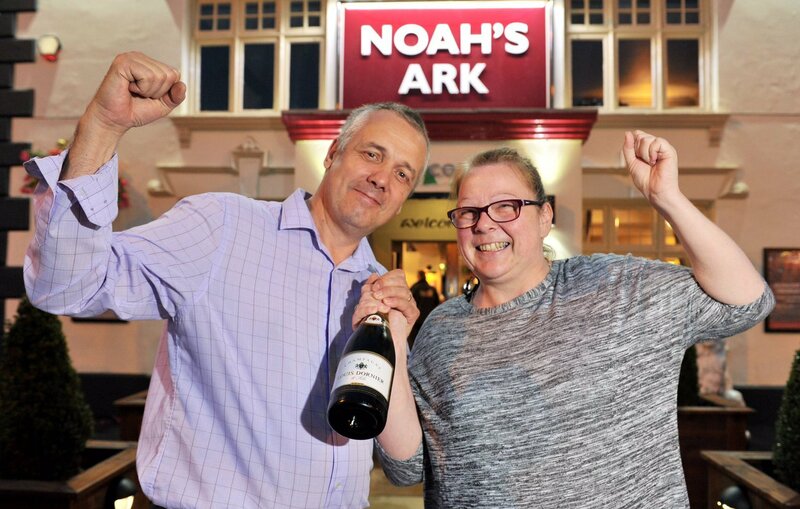 We have certainly found the level in our recent oompah gigs at Noah's Ark and Endon with audience renditions of Delilah, The Birdie Song and Living Next Door to Alice (yes, that one). Find out more by viewing our News page. 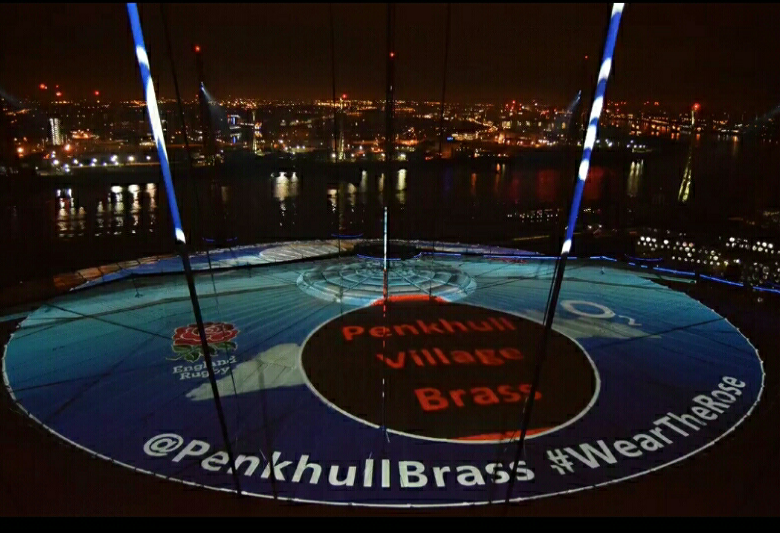 If you have any pictures or videos from the night we would love to see them, please share on Twitter with @PenkhullBrass using #PVBOompah or on facebook. Now we have to say that our annual Oktoberfest this year was even better than last year! We were worried that we wouldn't be able to top the atmosphere of 2015 and after the World Challenge gig the previous week there was a huge effort to make our flagship event the best yet - well it worked. The usual suspects were busy beavering away with the stage, the decorations and the frankfurters but this year we had Fenton's very own RAN Ales on hand with their selection of real ales brewed just down the road; they even created a unique brew for the occasion called Lief Brau - literal translation RAN Beer (Ale). The beer was such a massive hit with the audience that they are considering making it a regular on their list of beers. We were so impressed with the tweeting skills of the audience who certainly entered into the spirit finding the "bear" and sending pictures of him photo bombing the band! Now the mascot can't be called "bear" forever and so at our very own Oktoberfest we launched a competition to name that bear, some of the suggestions had the judges almost wetting themselves but they finally settled on Hans Offen Meine Nuts, or Hans for short, a truly Tyrolean name from our Bear who hails from Stoke's twin town of Erlangen via Munich and the Beer Kellers. Sadly health and safety rules meant the audience was a very select 100 in number; there were dozens of disappointed fans on Saturday morning as they called for tickets - get them early next year! Better still, how about we make it a two night run in 2017? Lively is the way to describe the audience, who really got into the spirit of Oompah with their costumes for the World Challenge fundraiser in Endon on 8th October. Despite the event finishing at 11.30pm most of the band were still awake at 3am; it's amazing what an adrenaline rush that last set can be, especially with such a receptive audience! The best bit? The amazing £1110 that was raised on the night - we are so happy for those involved. Check out the pictures on our Photo page. That's possibly the most fluid and mobile audience ever - over the 3 sets we probably played to 3 different audiences as customers popped in and out during the evening. The locals certainly seemed a little bemused when a troop of Lederhosen clad chaps marched into their pub but they were soon put at ease with waltzes and polkas to get their feet tapping and the beer flowing. We met so many new friends, new supporters and followers during the evening, but it seemed that what they really wanted as the night wore on was some good old Robbie, an Austrian sing-a-long, Delilah and Match of the Day for the football chaps and more worringly the Birdie Song beautifully performed by the bar staff!! 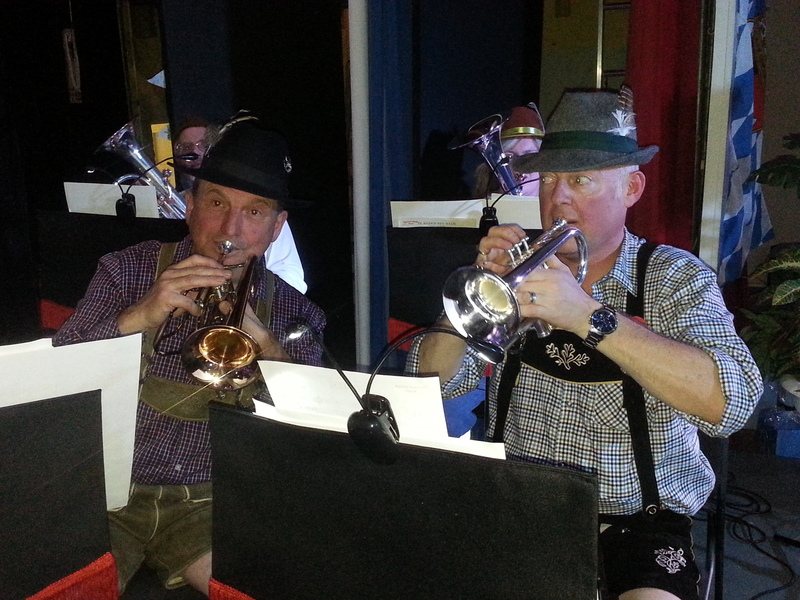 Come along to one of our Oompah nights yourself and see what all the excitement is about! Almost a full complement of players squashed together on stools and benches at Noah's Ark, Hartshill for our first performance at the newly refurbished pub to welcome home James who had embarked on a tour of all the pubs in the chain lasting five days. The weather was awful and the traffic dreadful which made for a very long and late last leg for James. The fanfare trumpeter announcing his achievement before the crowds and Deputy Lord Mayor was a very welcome sign that he had done it! Our Oompah Band prayed to the Weather Gods on the first day of the 6th Annual Beer Festival and they answered after awful rain earlier in the day. The fair evening weather saw a good size crowd enjoying the huge array of beers and ciders on offer; meeting some of the local brewers including Neville and Karen from RAN Ales from Fenton (whose Cherry Chilli Stout was sublime) and of course taking full advantage of the drinking songs being played by the Band. The repertoire of traditional Bavarian Oompah from the Beer Houses was punctuated as the night wore on with some 80s "cheesy" classics, the obligatory Robbie Williams (well we are in Stoke) and yet the one number that they all wanted again, and for our encore, that timeless classic - The Birdie Song!! Want to know how The Birdie Song works at a beer festival? Come and find us on our Diary Page or book us for your event. 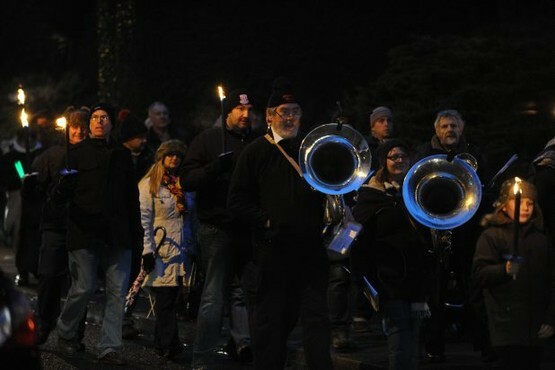 Penkhull Village Brass was recently called upon once again by SOT Council to help with the opening ceremony of the City of Sport 2016 hosted by olympic triple-jump champion Jonathan Edwards. Crowds of 4000 packed into the purpose built stands at Northwood Stadium for an Olympics style opening ceremony featuring sports clubs and teams from across the City. Beer, Rugby, Oompah - What else could you need? 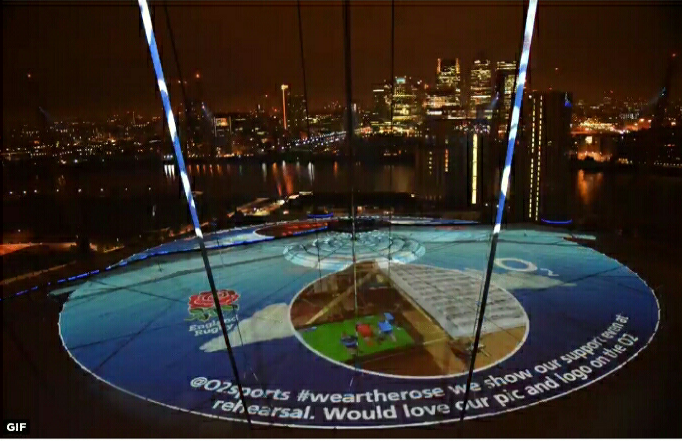 The final games of the RBS 6 nations took place on Saturday 19th March. 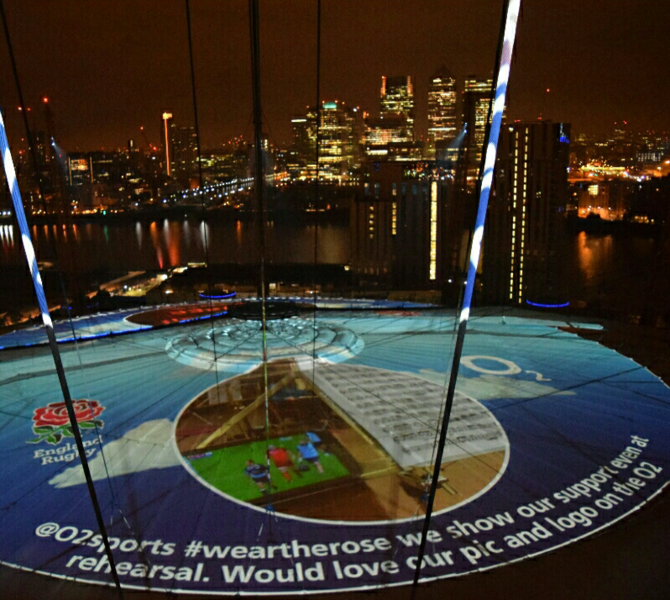 Everyone watched England gain the Grand Slam as they narrowly beat France in the last game of the day. Between the final two games, people enjoyed the excellent beer from Lymestone and sang and danced along to theirr favouite rugby anthems plus some Bavarian drinking tunes with Penkhull Village Brass. 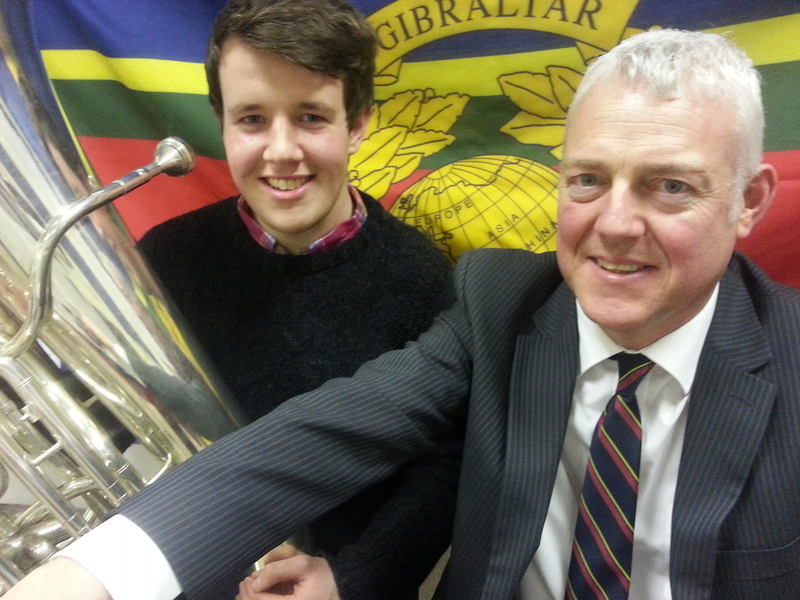 Hartshill teenager, Marcus Bushe has been tasting Life on the Ocean Wave recently as he joined 30 hopefuls in the company of HM Royal Marines Band Service at HMS Collingwood in Fareham for a week, looking at a career as a Royal Marines Musician. Marcus who is 18 and a student at Stoke’s 6th form college has been interested in a military career since he was 14 and has always admired the military bands, especially the world famous Band of Her Majesty’s Royal Marines. During the course at HMS Collingwood, members of the Band Service were on hand to guide the potential recruits and show them what life would be like if they joined, as well as joining the musicians in their rehearsals. All the hopefuls were then put under the spotlight as they worked on a number of quartet pieces to give the instructors more of a sense of their musical ability and determination. Gary has been encouraging Marcus to get as fit as possible before he auditions and potentially joins the Band Service; Marcus has therefore set himself the challenge of running the Potteries Marathon! A keen rugby player, Marcus can continue his sport up to a professional level in the service as well as study for a free music degree once he has completed basic training. 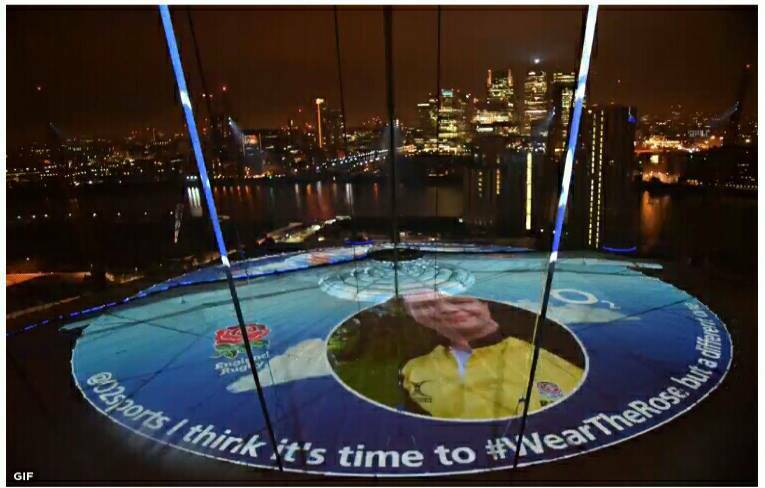 Cornet player Mike Mulroy who is not only a rugby fan but also a top rugby referee across the Midlands region featured in his kit on the O2, and as we rehearsed on Friday night with the England game playing (silently) on the stand, the team behind the Wear the Rose Campaign thought we should receive pride of place as well, projecting not only the Band's logo onto the Arena but a picture of our rehearsal too! 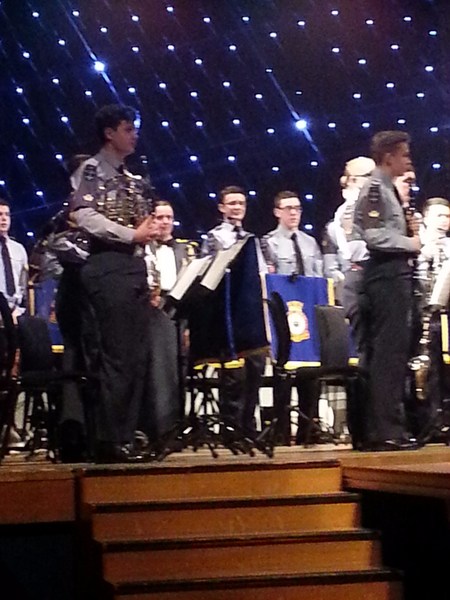 Cornet player Chris Mulroy, who plays with Penkhull Village Brass as well as Foden's Youth Band and NPAC, has been selected to play in the National Concert Band of the Air Cadet Organisation (Air Cadets). 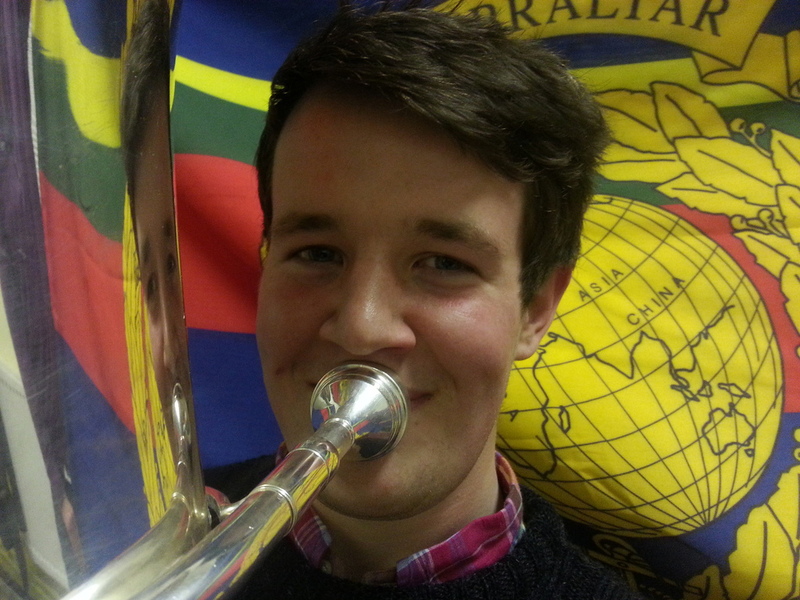 Chris joined the band in Staffordshire Wing in 2015 after being a cadet with 60 (Leek) Squadron for 2 years. 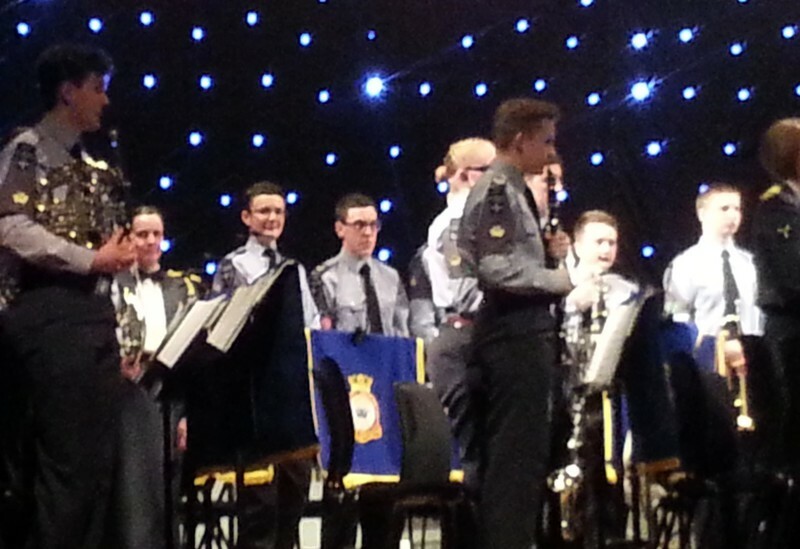 Staffordshire Wing Band was selected to represent their Region (Wales and West) in the summer of 2015 after winning four out of the five band categories and went on to the National competition in November where they were placed first nationally in two competitions. Staff from the Air Cadet Organisation (ACO) Music Service were on hand to both judge the competition and also to audition those cadets who had applied to join either the National Concert Band or National Marching Band for 2016. 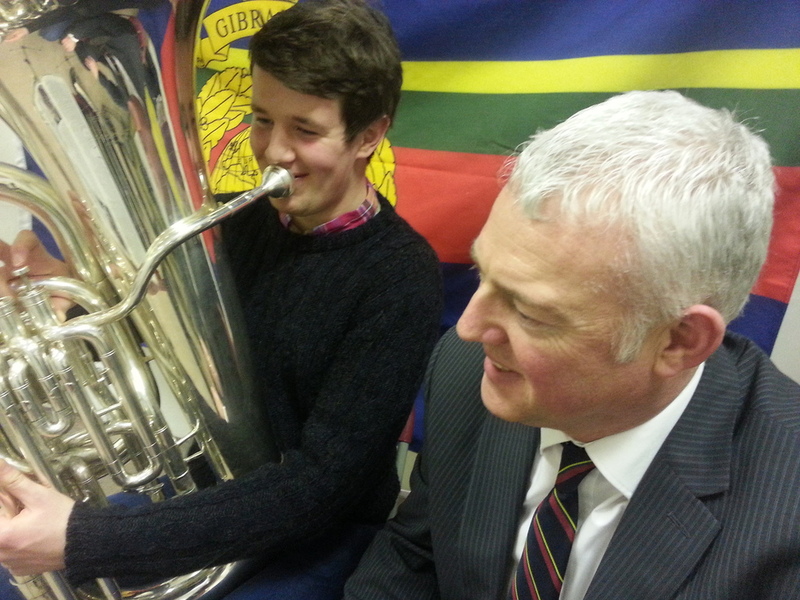 Chris applied to both bands in the autumn and whilst the selections for the Marching Band are yet to be announced, he recently discovered that he had been selected to play in the very prestigious National Concert Band. Chris’ first event takes place in February where he will train and rehearse alongside professional musicians from at the RAF College Cranwell in Lincolnshire, the event culminating in a concert at the famous Whittle Hall before an audience of around 400. 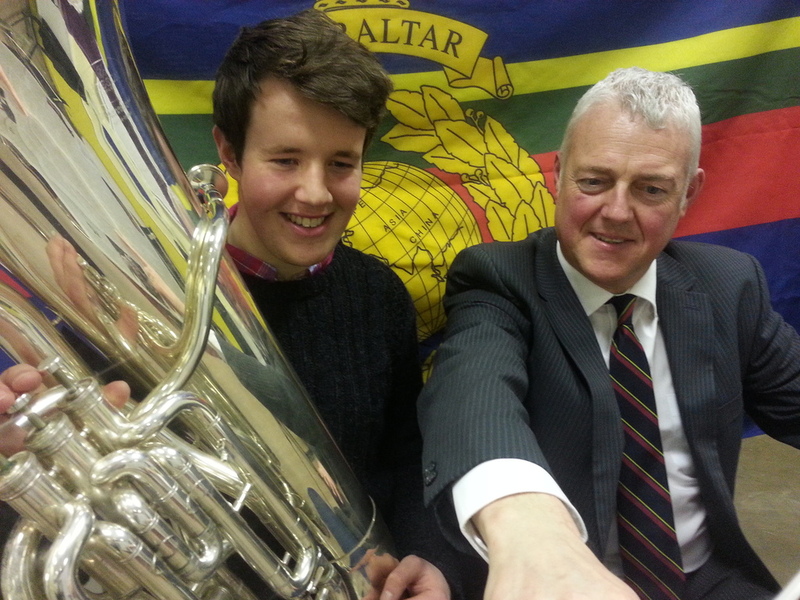 The National Concert Band has a full calendar this year as it is the 75th anniversary of the Air Cadets with events across the UK as the celebrations are planned. 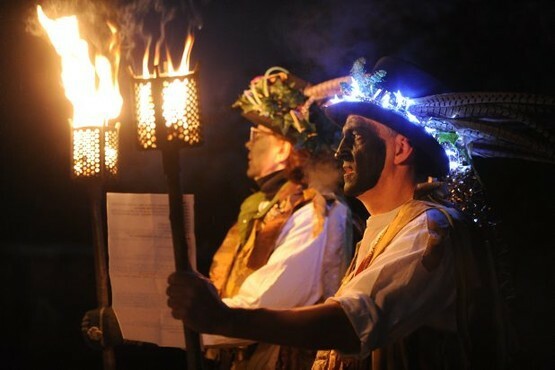 Previous regular events include performances at the Royal International Air Tattoo, the RAF Church of St Clement Dane in London and even Buckingham Palace. Chris commented “2016 is a huge year for the Air cadets, it is the 75th anniversary and there is an impressive programme planned including the Royal International Air Tattoo, Royal Albert Hall and the Birmingham Military Tattoo. I’m really looking forward to what the future holds. Chris follows his father in performing at the Royal International Air Tattoo almost 20 years later. Mike Mulroy who also plays for Penkhull Village Brass alongside Chris and his younger sister Aimee, was the Camp Commandant at the airshow for 4 years in the 1990s and led the Continuity Drill Display Team that performed at the airshow at that time attending Royal Gala Dinners with the team. Christopher attended a special Staffordshire Wing presentation on 13th January at County Hall Stafford where they received a Wing Commendation presented by the Lord Lieutenant for Staffordshire together with other members of the band. 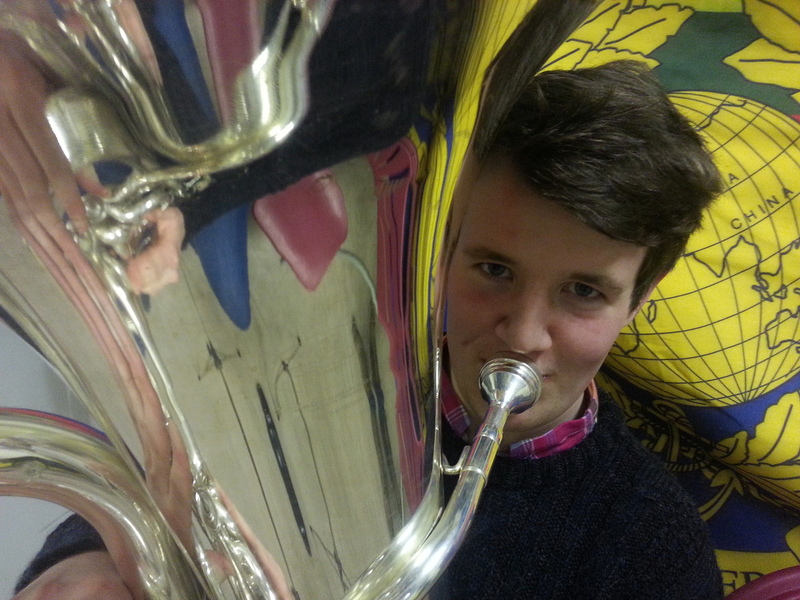 “I’ve had a really busy year musically with Penkhull and the Air Cadets; I never thought that in my first year with the cadet band that I would win on a Regional level, let alone a National competition and be selected for the National Concert Band." Chris continued, “I’m really looking forward to this year, this is such an enormous opportunity and I can't wait to take part in the RIAT concert and see what other events we will attend." 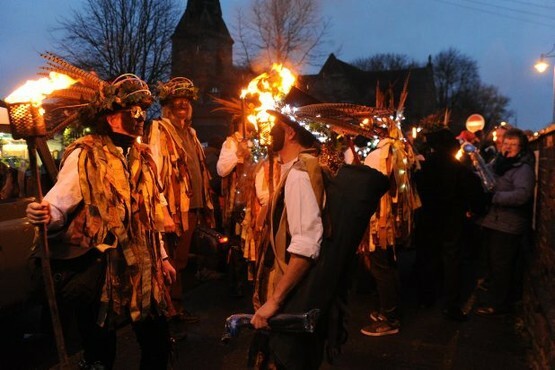 We joined with Domesday Morris for a torch-lit community procession from Penkhull Village Hall, stopping around the village and local pubs for music and dancing on Saturday 16th January 2016. 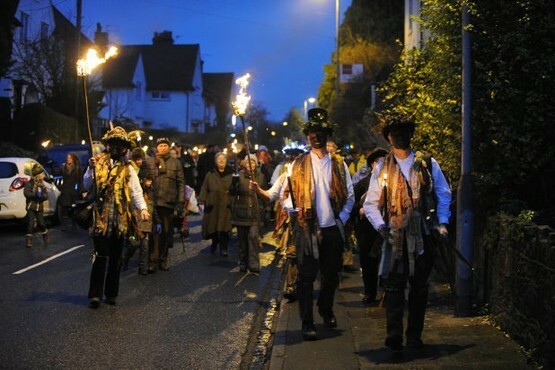 Although it was a very cold and damp evening the event was a huge success and well supported by the community. No we didn't spell it badly, unlike the typical Bavarian event held each October, we wanted to embrace the warm, flat, brown beer so typical and so beloved in our Green and Pleasant Land. With the help of Allan and Reece (so resplendent in his dress and pig tails) from The Greyhound Inn, the scene was reminiscent of the HofbrauHaus in Munich. The night was a roaring success and sold out with more than a week left until the event; we were still receiving requests for tickets at the door. 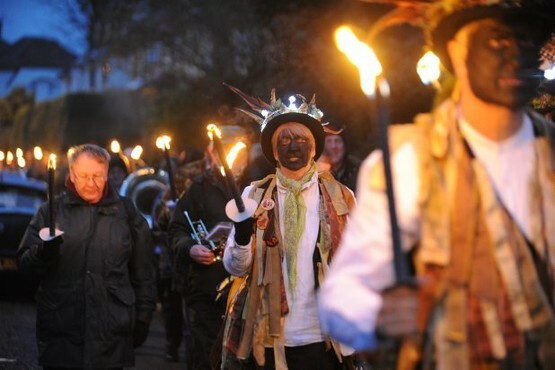 With additional entertainment from the Clay Chorus and Doomsday Morris the audience got more than just in the spirit, banging sticks and dancing late into the evening. Thanks are also due to Penkhull Jazz and Blues for their help in the kitchen or is that Kuche? Want another one next year? Let us know! 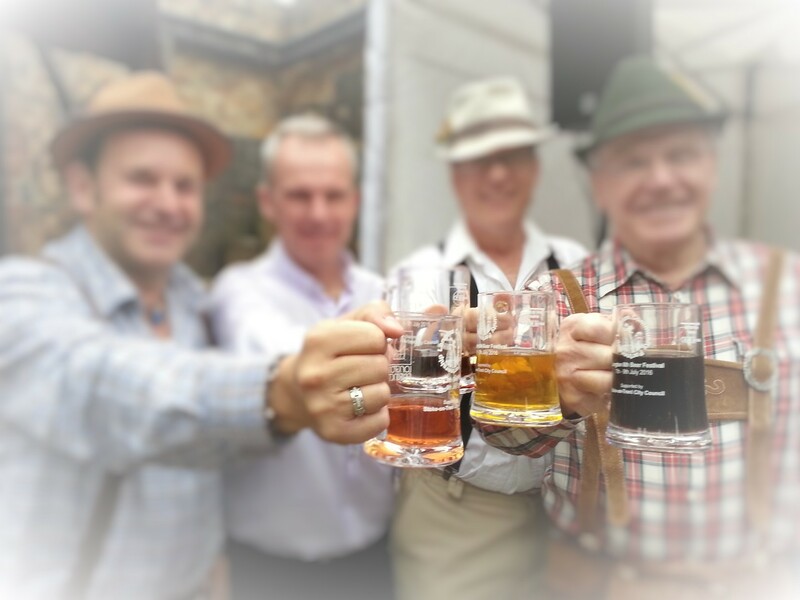 Check out our photo gallery for more pictures of the Oktobeerfest and all our recent engagements. Want to know how to make grown Royal Marines cry? It seems that Penkhull Village Brass have the recipe. Mix together the Royal Marines with the cycles in a large memorial. Play the Last Post, Reveille and Regimental March. Dispatch tearfully on their fantastic quest to raise funds for the Royal Marines Charitable Trust Fund. 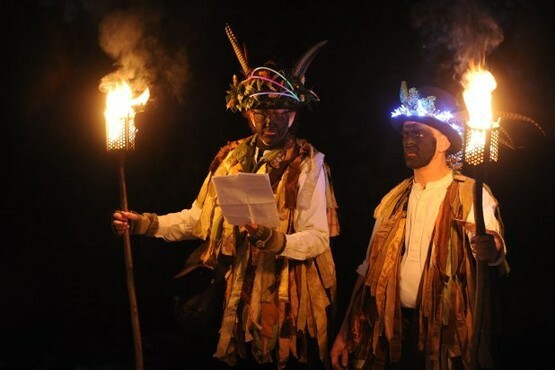 You can find out about the event and their quest below and see the wonderful letter that we received here. We would like to say a huge well done to everybody involved; we are so glad the trip was a success and look forward to helping you out again. A 150 mile Cycle & Handcycle ride from the National Memorial Arboretum to Teddington Lock (London) followed by a 22 mile row down the River Thames to HMS President, August 5th to 8th 2015. Members of the Stoke-on-Trent and Newcastle District RMA, including 58 year old Martin Kettrick who is paralysed from the chest down and totally confined to a wheelchair, after an abseiling accident during mountain training in the Lake District with Air Defence Troop, 3 Cdo Brigade in 1980. He will be accompanied by other former-bootneck members of the Branch, WO2 Merv Sheppard (Armed Forces Careers Service), Chris Gregory, Andy “Topsy” Topham, “Blinksy” Blinko, Mark Hassall, Kev Seller and wives, family and friends. They will be raising funds for the Royal Marines Charitable Trust Fund (RMCTF). Penkhull Village Brass has a direct connection to the RMA through our Chairman and former Royal Marines Bandmaster, Gary Standeven and we were asked by the team to provide a fitting musical send-off as they got under way. Life On The Ocean Wave doesn't seem terribly appropriate for Land Locked Lichfield, but it certainly lifted the spirits of these former Royal Marines. Being mid-week only a few of the band were able to join in but the result was a superb, tight and wonderful sound to send them on their way and we wish them all the best. The event will include a 150 mile bike & handcycle ride over three days (see picture below) starting at the National Memorial Arboretum at 10:00 on Wednesday 5th August. They end the first day at Rugby, followed by Oxford on Thursday afternoon 6th August and completing the ride on late afternoon Friday 7th August at Teddington Lock. 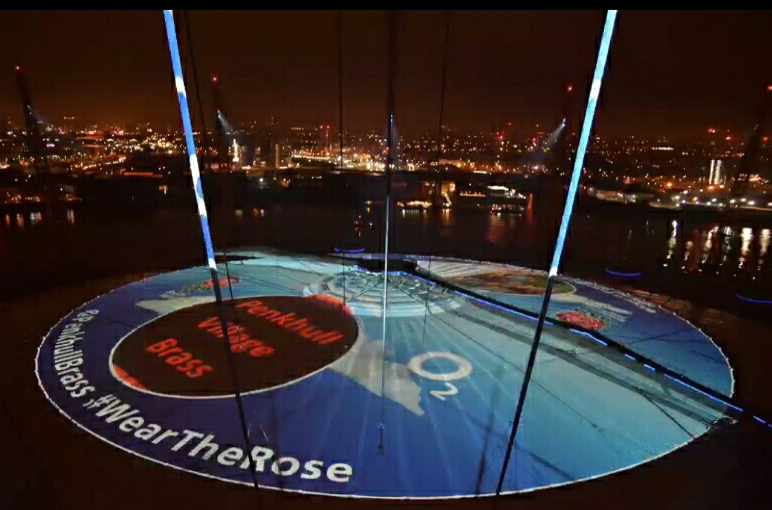 The 22 mile row down the River Thames will then commence at around 08:00 on Saturday 8th August 2015 to coincide with high tide, to arrive at HMS President, the HQ of the Royal Navy Reserves just below Tower Bridge in London sometime around midday. In addition to raising funds for the Royal Marines Charitable Trust Fund the aims of the challenge will be to encourage a cross section of the Royal Marines family to get involved with the overall running and logistics of the event. So far this has included the loan of an old admiralty sailing craft which has been completely overhauled by the members of the Stoke RMA for the rowing training undertaken by the lads taking part and the boat will be handed back for the benefit of local sea cadets within the North Staffordshire area to use as part of their normal seamanship training. The cycle and rowing team will include both Royal Marines Veterans, serving members, including the current Corps RSM Phil Gilby and wives and family. We are also hoping to get the support of the local Fire Service River Rescue Team consisting of some former-Royal Marines, who will oversee safety down the Thames and Royal Marines Reserves London who we hope will assist with some of the support and logistic aspects of the event making it a truly all encompassing Royal Marines family event in aid of the RMCTF. Have a look at the wonderful letter that we received here. Did you see our Chairman? Well you might not have noticed that former Royal Marines Warrant Officer, Gary Standeven was keeping his watchful eye on the proceedings at the Armed Forces Day in Longton park recently, but you may well have heard him. 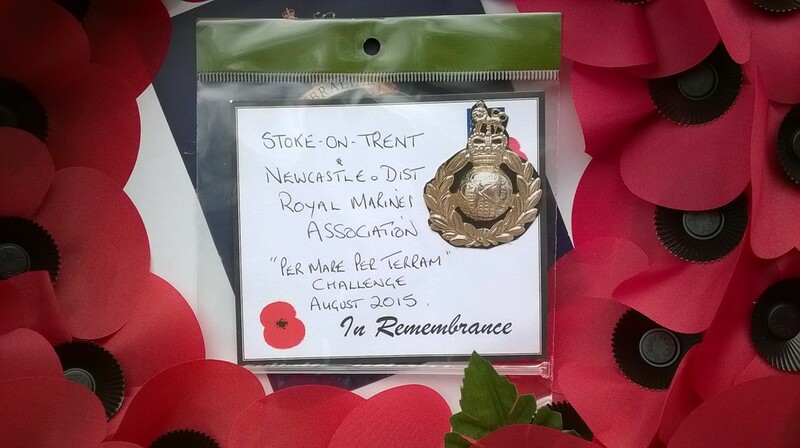 Gary was not only assisting with the Royal Marines Association stand and the parade of veterans, he was also interviewed by BBC Radio Stoke about his time in the Service and the events in the park. Did you venture to the Cosford Airshow? Our very own Chris Mulroy was playing as part of the Air Cadet Marching Band in the arena on Sunday 14 June to the amazing background of acts such as the Red Arrows and WWII Spitfires and Hurricanes. 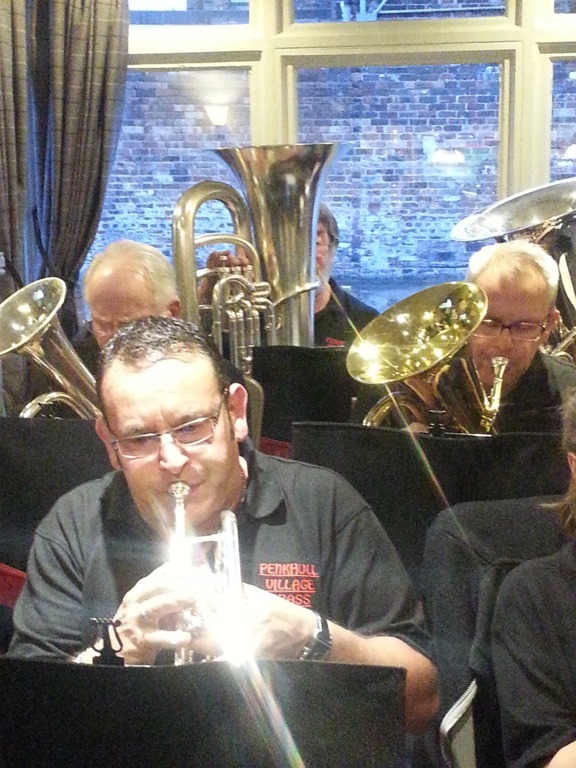 Chris is one of the founding players of Penkhull Village Brass on solo cornet and also a cadet with 60 (Leek) Squadron Air Training Corps. Chris can often be seen rushing to get changed from his cadet uniform into his red tie to join the band playing out after another engagement earlier in the day. 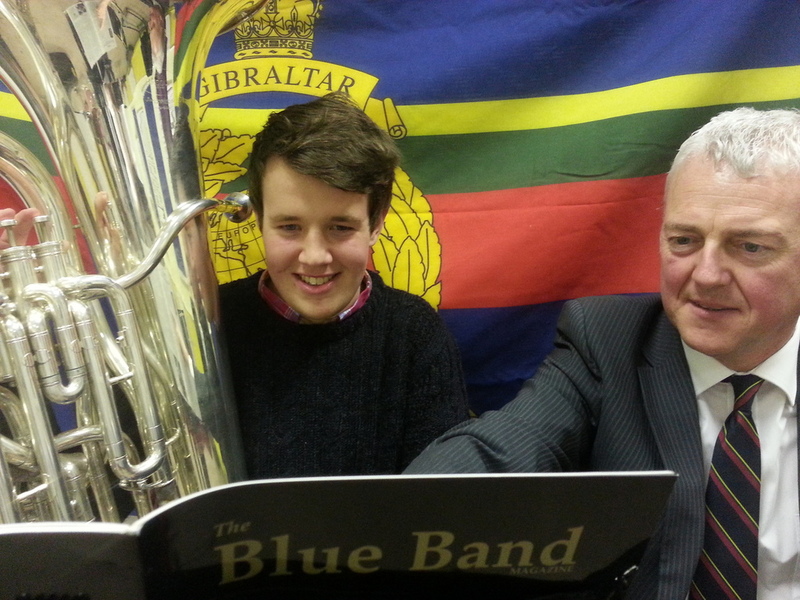 As a member of both the Wing Marching and Fanfare Band, Chris enjoys performing at a number of prestigious events and next year hopes to secure a place in the National Cadet Band and perform at the Royal Albert Hall and the Largest Military airshow in the World, the Royal International Air Tattoo at RAF Fairford, following in his father's footsteps as he was the Camp Commandant for the ATC at the airshow back in the 1990s. After an exhausting day Chris commented, "Although we were short on numbers today due to other commitments, it was a fantastic event. The weather unusually stayed good for the Cosford Airshow and we performed to some very good sized audiences." When asked about the other personnel at the show he replied "some of the support crews and display pilots came to watch us perform but it was so noisy at times especially when the RAF Typhoon was displaying that we had to work really hard as musicians. The Air Cadet Honorary Group Captain, Carol Vorderman MBE was also at the show representating the Air Cadets and came over to watch us play. It was a great day, I can't wait for next year." PVB joined forces with Stone Town Band on Saturday 16th May as they continued their contribution to the ever popular Stafford Music Festival with a lovely afternoon display of Brass Banding in Victoria Park. A sizeable audience took up residency on the chairs, benches and lawns to listen to the combined band perform traditional marches, overtures and pop music from the likes of ABBA. One lucky couple had a special treat as the band played whilst their photographer captured their wedding day across the stone bridge. It was a great collaboration between the bands and a support for each other that will certainly continue. We guested with the lovely people of Crich Brass during the 'Beside the Seaside' event on Bank Holiday Monday 25th May 2015. The village was transformed into a family-themed seaside resort complete with beach area, deck chairs, Ferris wheel and Punch & Judy show!